GNOME 3.28 is the latest version of GNOME 3, and is the result of 6 months’ hard work by the GNOME community. It contains major new features, as well as many smaller improvements and bug fixes. In total, the release incorporates 25832 changes, made by approximately 838 contributors. 3.28 has been named “Chongqing” in recognition of the team behind GNOME.Asia 2017. GNOME.Asia is GNOME’s official annual summit in Asia, which is only possible thanks to the hard work of local volunteers. This year’s event was held in Chongqing, China, and we’d like to thank everyone who contributed to its success. 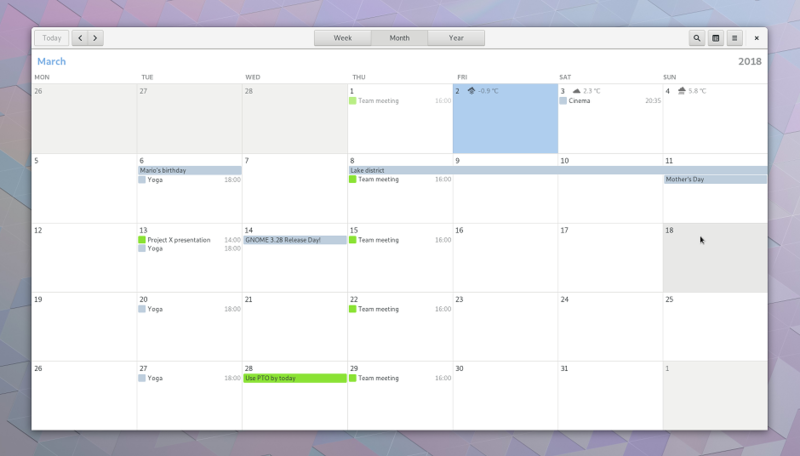 GNOME 3.28 makes it easier to keep track of the things that are important to you, with two new features. In Files, it’s now possible to star files and folders. Once they’ve been added, starred items can be easily viewed in a special location that can be opened from the sidebar. Favorites have also been added to the Contacts application, where they appear pinned to the top of the contact list — great for contacts that you often return to. In Clocks, it’s now possible to add the UTC timezone to your world times. The Contacts application now allows sorting by either surname or first name. It also has a new shortcuts window and a number of interface improvements. The month view in Calendar has been improved. Events are presented in a way that’s easier to read, and it’s now possible to seamlessly expand cells which are overflowing with events. Weather information has been added to the Calendar application, so it’s possible to see the forecast alongside your events. To Do has an updated task view design, which makes it easy to reorder tasks with drag and drop. Todoist integration has also been improved. 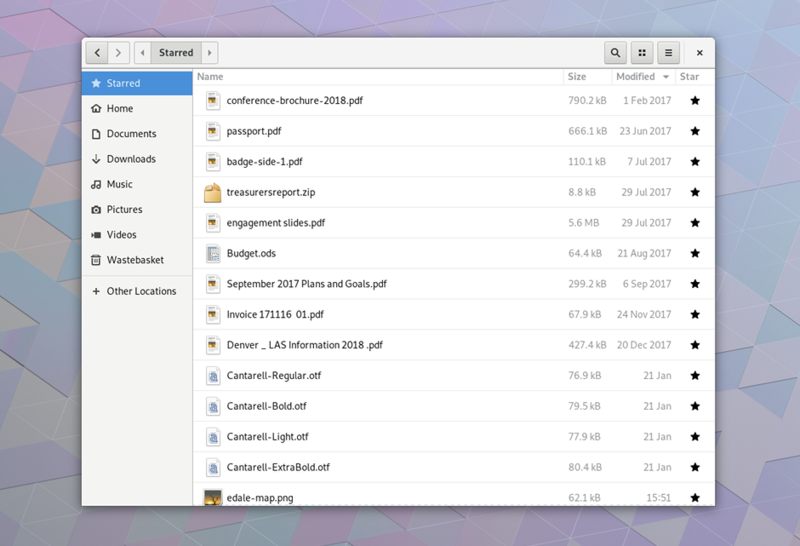 GNOME 3.28 comes with more beautiful things! First, and most significantly, GNOME’s default interface font (called Cantarell) has undergone a significant update. Character forms and spacing have been evolved, so that text is more readable and attractive. Several new weights have also been added — light and extra bold — which are being used to produce interfaces that are both modern and beautiful. 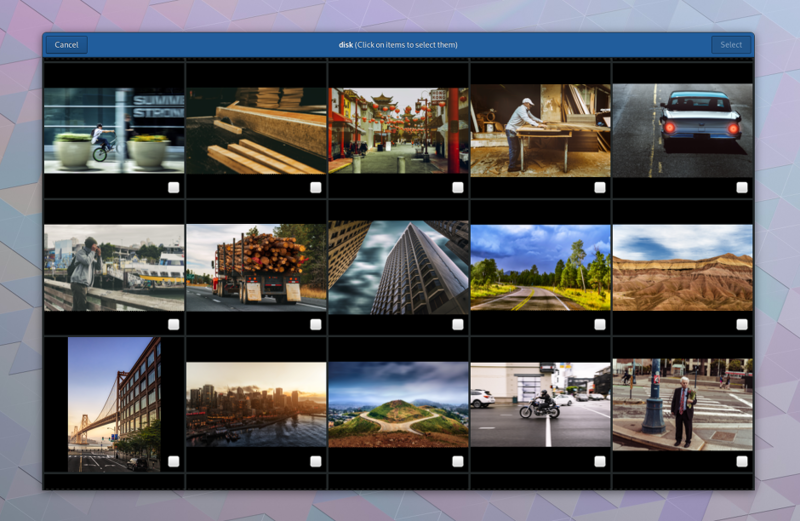 Other beautiful things include GNOME’s collection of background wallpapers, which has been updated to include a lovely set of photographs, and the selection of profile pictures, which has been completely updated with attractive new images to pick from. 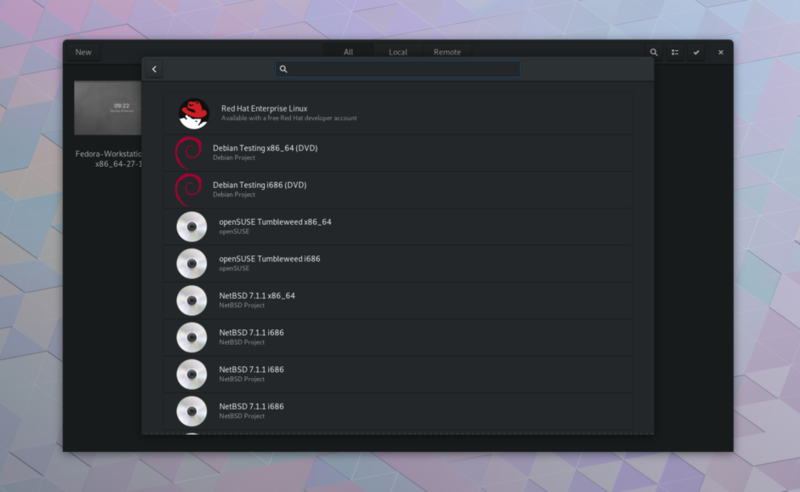 Boxes, the GNOME application for using remote and virtual machines, has a number of new features and enhancements for GNOME 3.28. One major new feature is automatic downloading of operating systems, straight from the new box assistant. To create a virtual machine, all you have to do is pick the operating system you want to use, and Boxes will do the rest. The new version of Boxes also makes it easy to transfer files between your computer and virtual machines. To transfer files, you can either drag and drop them on to the Boxes window, or select the Send Files option and select files to be transferred using a file chooser. In both cases, Boxes provides feedback about the progress of file transfers, so you know how long they are going to take, as well as when they have finished. Media handling and entertainment have gotten better in GNOME 3.28. Many of these changes are in Photos. It has a new import from device feature which makes it easy to add photos to your collection from removable media, such as SD cards and USB drives. This feature automatically detects devices that contain new images and it also allows organizing new images into albums as they’re imported. Other improvements in Photos include new editing tools for shadows and highlights and performance improvements. Videos is now able to play MJPEG files. In Music, it’s now possible to reorder playlists using drag and drop. Games, the GNOME application for retro console and arcade games, has a new CRT video filter that makes game visuals look like they are being played on an old-fashioned TV. Additionally, gamepad rumble will now work in many cases. GNOME’s on-screen keyboard has been completely rewritten for 3.28, and it is far easier to use than the previous version. The new keyboard automatically activates when a text area is selected, and the view is shifted to ensure that the text area is visible while typing. A variety of layouts are supported for different locales. 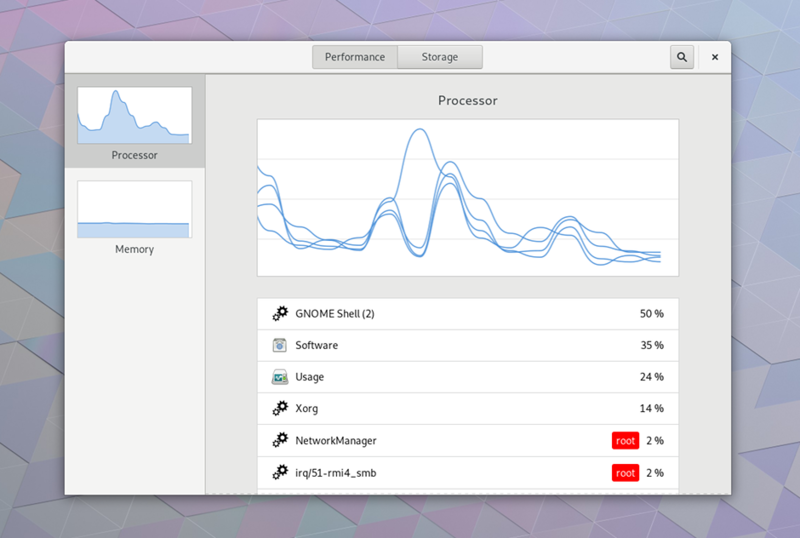 Usage is a new GNOME application that is being introduced in 3.28 as a technology preview. The new application is designed to make it easy to diagnose and resolve performance and capacity issues. The initial version includes features for examining CPU and memory consumption. Problem areas are highlighted, making it quick and easy to identify the source of issues. The Usage preview also allows disk usage to be examined. The interface for this highlights common sources of disk usage that can be cleared, such as the trash and temporary files. More Usage features are planned for the future, including the ability to investigate network, power and data usage. The latest GNOME release comes with extended device support. Most significantly, GNOME 3.28 comes with integrated Thunderbolt 3 connection support. This includes security checks that are designed to prevent data theft through unauthorized Thunderbolt 3 connections. Feedback is also shown in the top bar, to indicate when Thunderbolt 3 is active and when a connection is being established. All touchpads now use a gesture for secondary click (the equivalent to right click on a mouse) by default. To use the gesture, keep one finger in contact with the touchpad and tap with another finger. In many cases this replaces tapping areas of the touchpad as the default secondary click method. A choice between the two behaviors is available in the Tweaks application. Information is now shown about the power level of connected Bluetooth Low Energy (LE) devices. The battery level of these devices is now shown in the Power settings, and a notification will warn if they are running low on power. The application categories in Software have a new look, and make it possible to sort applications by rating or by name. Also in Software, the Software Sources dialog has been improved and renamed to Software Repositories. The new version provides a more reliable and transparent view of your software repositories. It also allows enabling, disabling and removing each one. Fonts, the GNOME font viewer, now makes it possible to see extra information about each font on the system, including the style, version, copyright and layout features. Variable fonts are a new type of font that allow the weight to be set dynamically, rather than having predefined weights like bold or extra bold. GNOME’s font chooser now supports these fonts and allows you to adjust their properties when selecting a font. The font chooser also has an improved list and now allows you to search for fonts by name. When you click on a place in Maps a picture of it now gets shown, if it’s available on Wikipedia. The Terminal has a list of improvements, including a redesigned preferences window, which combines the previously separate Preferences and Profile Preferences windows. Other enhancements include support for double, wavy and colored underlines, blinking text, and options for changing line and letter spacing. Belarusian, Croatian, Czech, Greek, Lithuanian, Polish, Russian, and Ukrainian dates are now displayed in the correct grammatical form. dconf-editor has had some big changes, with a new layout for lists and search results, as well as technical improvements under the hood. When Settings is launched, it shows the last shown settings panel, which reduces the amount of work if you frequently change the same settings. GNOME 3.28 also has lots to offer developers, and is translated into many languages. GNOME’s software is Free Software: all our code is available for download and can be freely modified and redistributed. To install it, we recommend that you wait for the official packages provided by your vendor or distribution. Popular distributions will make GNOME 3.28 available very soon, and some already have development versions that include the new GNOME release.